Decorative garden pots. I happened to have a tall pot and a short pot with similar colors and shapes in the shed, not being used. You could also use galvanized pails, terra cotta pots, some scrap wood nailed together or even plain black plastic nursery pots wrapped with raffia or twine. $0. Assortment of pots, bricks, etc. I just happened to have a random selection of these kinds of things in my shed. $0. My total project total was $18.75, but that includes $13.02 of plants that will go in the garden permanently. Worth it to me. Step 3: Load in the plants. First, place the large bundle of grass into the large pot in back. Wedge it in with an upside down pot or other medium-sized item that will also create a shelf. Next add the upright plant in the middle back. Arrange the trailing and filler plants around the edge. If you have asymmetrical plants like I did, have one pot mirror the other. Make sure to leave a space in front. 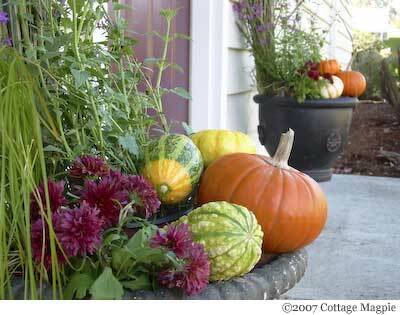 Fill the space with bricks or scrap wood up to the rim, making a shelf to pile the pumpkins and gourds. Step 4: Add the Pumpkins Start with your largest pumpkins or gourds in front and arrange the rest around it until it makes a pleasing display. Step 4: Refresh and Rotate As the display begins to deteriorate, give it a holiday season refresh by replacing the grasses with twigs and pushing the cut ends of evergreen clippings into the potted plants for the rest of winter. That's it! I hope you enjoyed this project. If you decide to do this or another seasonal entry project using materials from your garden, let me know!